Are you among the one who is having a dream of government job? then Rajasthan government is giving you that opportunity. 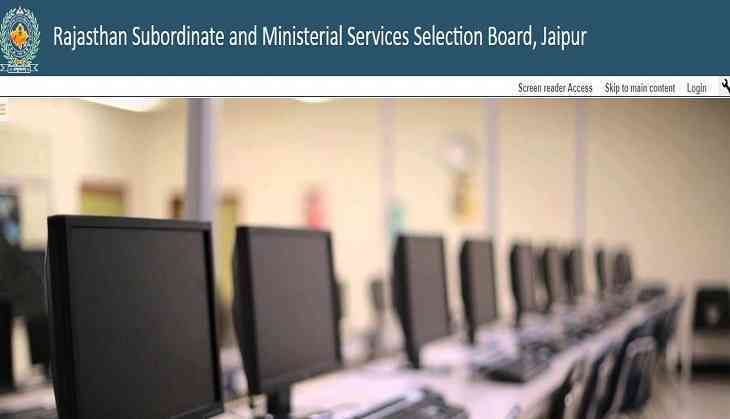 Yes, Rajasthan Subordinate and Ministerial Service Selection Board (RSMSSB) has invited the applications for 11,255 posts for the candidates. As per the reports, the recruitment process will be done for LDC/Junior Assistant in Departments/Offices Under State Govt, RPSC & Govt Secretariat, Rajasthan on Direct Recruitment. Therefore, all the interested and eligible candidates can apply for the posts from 10 May to 8 June till 12 pm. Students should check the eligibility before applying for the posts. As per the official announcement, only those candidates can apply for the posts who have attained the minimum age 18 years and maximum age is 40 years only. Since last 3 years, RSMSSB didn’t conduct the examination for Clerk posts therefore, there will be a three years age relaxation in max age limit given to the applicants. According to the recruitment board, after the submission of online application forms, the examination will be held in September this year. According to the scheme of examination, the exam will be conducted in two phases. In the first session, there will be a paper on General Knowledge, Mathematics and Science. While in the second phase, the question will be asked from General Hindi and English. However, both the papers will be of 100-100 marks for which students will get 3 hours for each paper to solve.